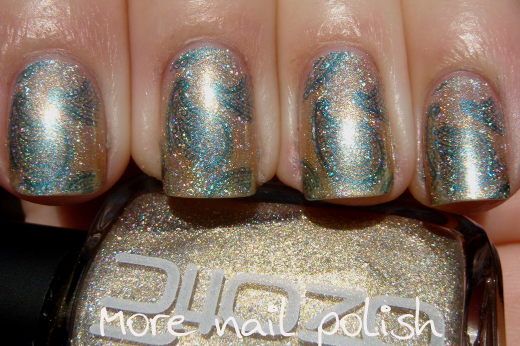 One of the things I love most about having a passion for polish, is being able to share it with others. The design I'm showing here today is one that I put together for a lady in my team at work. 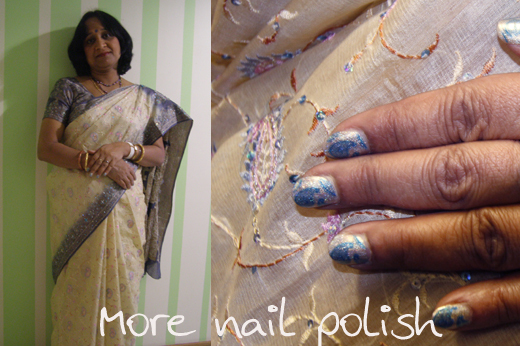 She had an event to attend the weekend before last and she bought in the Sari she was planning to wear, to see if I had any polishes that would match. Do I have a polish to match? HA! Her Sari was a beautiful gold with a blue trim edge. It was also embroidered with paisley design. We planned a little nail painting session for during our lunch break on the Friday prior and went off to the breakout area on our floor in the office. The night before I planned and tried out the design I was going to do. 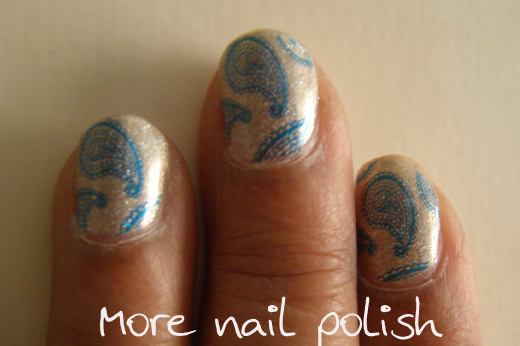 I chose Ozotic 604 and stamped with a blue polish using BM-315. I actually tried stamping with two different coloured blues, this one one much more subtle, and my friend chose the darker blue which I didn't photograph on me. 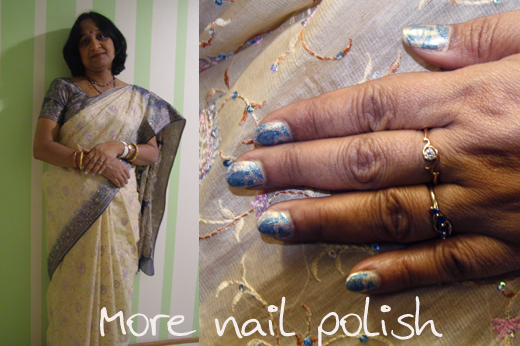 Here is my friend in her Sari and showing off her nails. I have to say that painting someone else's nails is so much harder than painting your own, but I'm happy with how it came out (and I know she was too). Do you guys get asked to paint your friends nails often? Do you love sharing the fun like I do? I agree, painting other people's nails are so much more challenging! I'm just way too used to my own small nails. 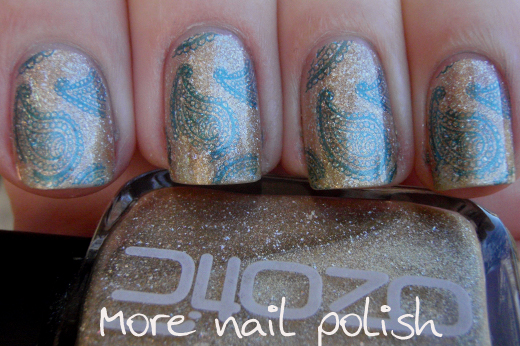 This looks really nice, I really want a paisley stamp! 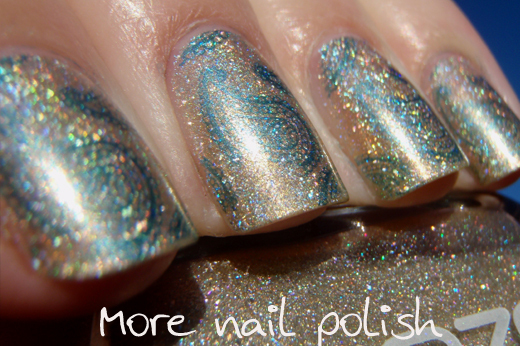 Do you know the name of the blue polish? Paisley is one of my favourite motifs, and I like both of your combinations very much. Perhaps the darker one a bit more because the design is more prominent. Every time I see someone use the latest BM collection I think I need it and you are NO exception! Simply beautiful. I too have a hard time painting someone else's nails. It is a weird angle plus I am must more critical of how it turn's out because I want them to be completely happy with it. I don't know how people do it fir a living. Lovely! I love sharing nail art with all my friends, I think sometimes I'm too keen! These are beautiful! I don't really like painting other people's nails. It's so much harder and I'm always afraid that they'll be disappointed with the design. BUT if someone really wants me to paint their nails I'll totally do it. How can you say no to a friend? It really is a lot more difficult to do someone elses nails, because with your own you can screw up all you want, no one will notice, but with someone else's hands, they'll notice every little detail. This is a very beautiful look. I love this stamp..its soo perfectly indian!! U did a gorgeous job on her hands..love the combi!! Me too get asked at owrk to do manis..and I have done them too ..hehe! Your design turned out to be gorgeous! I love to paint other ladies' nails. I get so much joy from nail polish that I want my friends to have some of it, too. The best was watching my Grammy, who typically only wears varying shades of pink and red, discover that she loved having a blue, green and teal glitter sandwich! And we nail polish addicts usually have more polish than we'll ever use up on our own. This looks beautiful and matches her sari so well. That Ozotic really did the trick! Your friend looks gorgeous. My mother is my swatch and stamp guinea pig. She's started a pretty nails fad at her work (she's works in the pharmacy department of one of our hospitals). 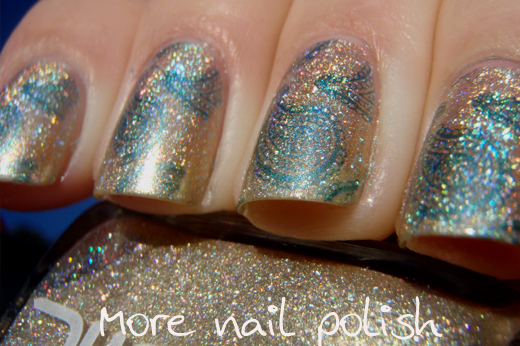 So rather than surgically clean nails to go with the scrubs they're all sporting sparkly nails. I think it's hilarious! Funny thing is I get more requests from my guy friends for me to paint their nails than from girls. Pretty sure that's not normal! oh gee, I have enough trouble painting my own nails. I always thought painting someone else's would be easier. Lovely manicure, and your friend looks beautiful. Thank you for sharing.